Windows 8 operating system by default doesn’t come with a start menu. And many windows user miss this button and they feel Windows 8 is incomplete without it. There are so many apps out there to add Start button in Windows 8. And iobit Start Menu 8 is one among them. Version 1.2 was officially released today and it brings full support for Windows 8.1, which means that you shouldn’t experience any bugs when running the app on Microsoft’s latest OS update. In addition, the new build comes with improved UI for easier understanding, while also bringing font settings and a new option to distinguish newly-installed programs. Menu 8 is safe and secure, and is 100% free of malware. Start Menu 8 not only brings back the convenient Start Menu to Windows 8, but also allows you to bypass Metro screen on start of Windows 8 and boot to desktop directly. 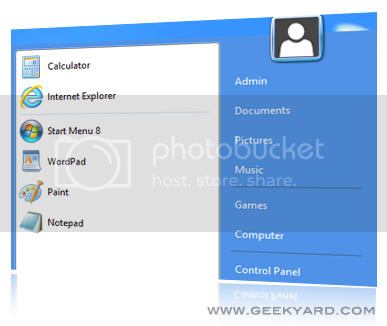 Start Menu 8 brings back Start Menu where you can get quicker access to programs, documents and files, control panel and settings.